The Button continues in Flash 21. As great as the first part of the story was, last week in Batman, this one is even better. And, as with last week, there is an awful lot I cannot say. Howard Porter does the art on this story, and really gets to go to town. I love the way he shows the Batcave, with the effects of the fight between Batman and the Reverse-Flash, but all sectioned off and labelled by the Flash, showing how much he really is a forensic scientist. Where Porter gets to go wild is in the scenes that take place in Justice League Watchtower’s trophy room. I delight in illustrations like this. I love examining the various objects, seeing how many of them I can recognize. To my surprise, there were a number of items pertaining directly to the Justice Society of America. The Flash also alludes to the JSA, when he talks about the helmet that he had a vision of, the one we recognize as Jay Garrick’s. And then, of course, there was the scene in which we see an old member of the Justice Society. Oh, I wasn’t going to mention that. Just forget you read that, ok? 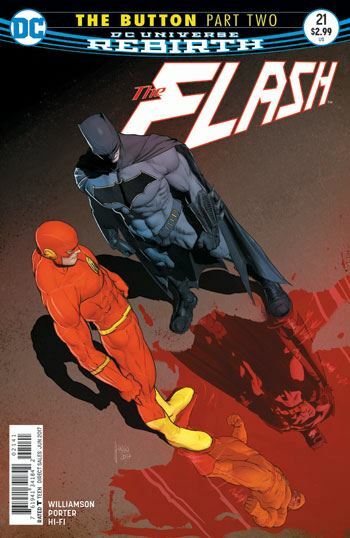 Batman and the Flash share information, and begin their investigation into the murder of the Reverse-Flash. 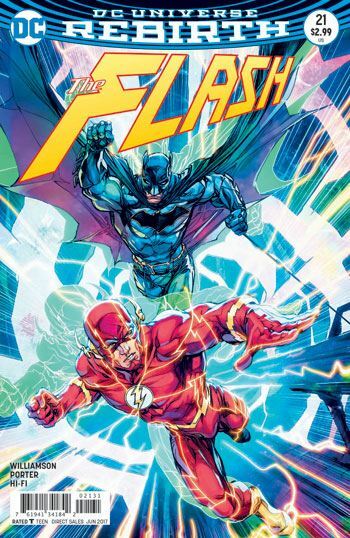 Because the Reverse-Flash was a time traveller, Flash decides to pull out his old Cosmic Treadmill, and Batman insists upon coming along. The story then becomes a sheer delight for comic geeks. Again, I don’t want to reveal too much, but I have to mention the wonderful moment when Flash and Batman see the creation of the Justice League, the original way it happened, which neither of them recall or recognize. The issue builds to a very good ending, but I won’t say anything about that. I have developed a theory about the murder of the Reverse-Flash. I could well be wrong, and I will reveal a few things about the issue as I make my case, so if you don’t want to know anything more about the issue, stop reading here. 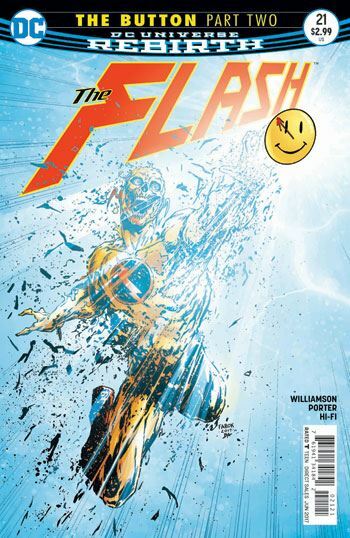 The Flash finds traces of his own unique speed force signature on the corpse of the Reverse-Flash, and wonders if, at some point in the future, he will kill him. We also see, as the heroes travel on the Cosmic Treadmill, the Flash’s death during Crisis on Infinite Earths. There are plenty of references to reality changing, and the pre-Crisis world. And, of course, in that pre-Crisis world the Reverse-Flash WAS killed by the Flash. So I do not think he was killed by this Flash at some point in the future. I think he was killed by the pre-Crisis, pre-Flashpoint, Flash. I’m probably wrong. I almost always am on these kinds of mysteries. But that’s my guess.